A mapping class that extends curved boundary descriptions into the interior of the computational domain. The outer curved boundary description is assumed to be given by another manifold (e.g. a polar manifold on a circle). The mechanism to extend the boundary information is a so-called transfinite interpolation. where \(\bf x_0, \bf x_1, \bf x_2, \bf x_3\) denote the four bounding vertices bounding the image space and \(\bf c_0, \bf c_1, \bf c_2, \bf c_3\) are the four curves describing the lines of the cell. If a curved manifold is attached to any of these lines, the evaluation is done according to Manifold::get_new_point() with the two end points of the line and appropriate weight. In 3D, the generalization of this formula is implemented, creating a weighted sum of the vertices (positive contribution), the lines (negative), and the faces (positive contribution). 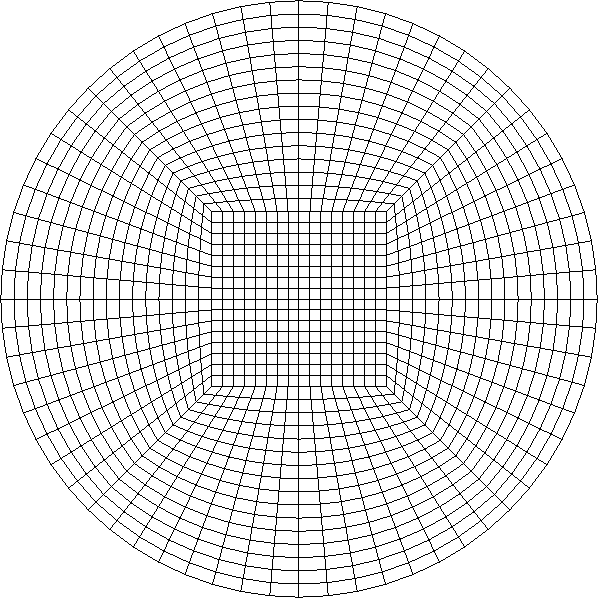 This manifold is usually attached to a coarse mesh and then places new points as a combination of the descriptions on the boundaries, weighted appropriately according to the position of the point in the original chart coordinates \((u,v)\). This manifold should be preferred over setting only a curved manifold on the boundary of a mesh in most situations as it yields more uniform mesh distributions as the mesh is refined because it switches from a curved description to a straight description over all children of the initial coarse cell this manifold was attached to. This way, the curved nature of the manifold that is originally contained in one coarse mesh layer will be applied to more than one fine mesh layer once the mesh gets refined. Note that the mechanisms of TransfiniteInterpolationManifold are also built into the MappingQGeneric class when only a surface of a cell is subject to a curved description, ensuring that even the default case without this manifold gets optimal convergence rates when applying curved boundary descriptions. If no curved boundaries surround a coarse cell, this class reduces to a flat manifold description. This manifold is used in a few GridGenerator functions, including GridGenerator::channel_with_cylinder. For performance and accuracy reasons, it is recommended to apply the transfinite manifold to as coarse a mesh as possible. Regarding accuracy, the curved description can only be applied to new points created from a given neighborhood, and the grid quality is typically higher when extending the curved description over as large a domain as possible. Regarding performance, the identification of the correct coarse cell in the get_new_point() method needs to pass all coarse cells, so expect a linear complexity in the number of coarse cells for each single mapping operation, i.e., at least quadratic in the number of coarse mesh cells for any global operation on the whole mesh. Thus, the current implementation is only economical when there are not more than a few hundreds of coarse cells. To make performance better for larger numbers of cells, one could extend the current implementation by a pre-identification of relevant cells with axis-aligned bounding boxes. Definition at line 941 of file manifold_lib.h. Definition at line 1556 of file manifold_lib.cc. Definition at line 1567 of file manifold_lib.cc. Make a clone of this Manifold object. Implements Manifold< dim, spacedim >. Definition at line 1577 of file manifold_lib.cc. Initializes the manifold with a coarse mesh. The prerequisite for using this class is that the input triangulation is uniformly refined and the manifold is later attached to the same triangulation. Whenever the assignment of manifold ids changes on the level of the triangulation which this class was initialized with, initialize() must be called again to update the manifold ids connected to the coarse cells. The triangulation used to construct the manifold must not be destroyed during the usage of this object. Definition at line 1589 of file manifold_lib.cc. Return the point which shall become the new vertex surrounded by the given points surrounding_points. weights contains appropriate weights for the surrounding points according to which the manifold determines the new point's position. The implementation in this class overrides the method in the base class and computes the new point by a transfinite interpolation. The first step in the implementation is to identify the coarse cell on which the surrounding points are located. Then, the coordinates are transformed to the unit coordinates on the coarse cell by a Newton iteration, where the new point is then computed according to the weights. Finally, it is pushed forward to the real space according to the transfinite interpolation. Reimplemented from Manifold< dim, spacedim >. Definition at line 2434 of file manifold_lib.cc. Compute a new set of points that interpolate between the given points surrounding_points. weights is a table with as many columns as surrounding_points.size(). The number of columns in weights must match the length of new_points. The implementation in this class overrides the method in the base class and computes the new point by a transfinite interpolation. The first step in the implementation is to identify the coarse cell on which the surrounding points are located. Then, the coordinates are transformed to the unit coordinates on the coarse cell by a Newton iteration, where the new points are then computed according to the weights. Finally, the is pushed forward to the real space according to the transfinite interpolation. The implementation does not allow for surrounding_points and new_points to point to the same vector, so make sure to pass different objects into the function. Definition at line 2454 of file manifold_lib.cc. Internal function to identify the most suitable cells (=charts) where the given surrounding points are located. We use a cheap algorithm to identify the cells and rank the cells by probability before we actually do the search inside the relevant cells. The cells are sorted by the distance of a Q1 approximation of the inverse mapping to the unit cell of the surrounding points. We expect at most 20 cells (it should be up to 8 candidates on a 3D structured mesh and a bit more on unstructured ones, typically we only get two or three), so get an array with 20 entries of a the indices cell->index(). Definition at line 2120 of file manifold_lib.cc. Finalizes the identification of the correct chart and populates chart_points with the pullbacks of the surrounding points. This method internally calls get_possible_cells_around_points(). Return an iterator to the cell on which the chart is defined. Definition at line 2207 of file manifold_lib.cc. Pull back operation into the unit coordinates on the given coarse cell. This internal function is currently not compatible with the ChartManifold::pull_back() function because the given class represents an atlas of charts, not a single chart. Thus, the pull_back() operation is only valid with the additional information of the chart, given by a cell on the coarse grid. An alternative implementation could shift the index depending on the coarse cell for a 1-to-1 relation between the chart space and the image space. Definition at line 1987 of file manifold_lib.cc. This internal function is currently not compatible with the ChartManifold::push_forward() function because the given class represents an atlas of charts, not a single chart. Thus, the push_forward() operation is only valid with the additional information of the chart, given by a cell on the coarse grid. An alternative implementation could shift the index depending on the coarse cell for a 1-to-1 relation between the chart space and the image space. Definition at line 1937 of file manifold_lib.cc. Gradient of the push_forward method. This internal function is not compatible with the ChartManifold::push_forward_gradient() function because the given class represents an atlas of charts, not a single chart. Furthermore, this private function also requires the user to provide the result of the push_forward() call on the chart point for the single use case of this function, namely inside a Newton iteration where the gradient is computed by finite differences. Definition at line 1958 of file manifold_lib.cc. Definition at line 1102 of file manifold_lib.h. The level of the mesh cells where the transfinite approximation is applied, usually level 0. Definition at line 1108 of file manifold_lib.h. In case there all surrounding manifolds are the transfinite manifold or have default (invalid) manifold id, the manifold degenerates to a flat manifold and we can choose cheaper algorithms for the push_forward method. Definition at line 1115 of file manifold_lib.h. A flat manifold used to compute new points in the chart space where we use a FlatManifold description. Definition at line 1121 of file manifold_lib.h. The connection to Triangulation::signals::clear that must be reset once this class goes out of scope. Definition at line 1127 of file manifold_lib.h.